1 Ballpoint Pen 1.0mm with black ink. 4 - 1.5V batteries are included. This Batman Pen is a great gift for a true Batman Fan so he can have his hero beside him at all times! 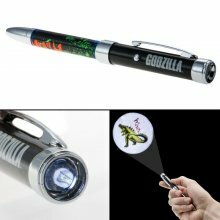 Right from the Dark Knights Belt, The Batman Projector Pen features The Caped Crusader's famous Bat Signal. Press the button on the side of the pen to project the light of the Bat Signal on any surface!